This is the third episode of Kim Possible's Sitch in Time called A Sitch in Time 3 Future. Travel into the future to save the world from Shego! This is the 3rd part of the action game Sitch In Time. 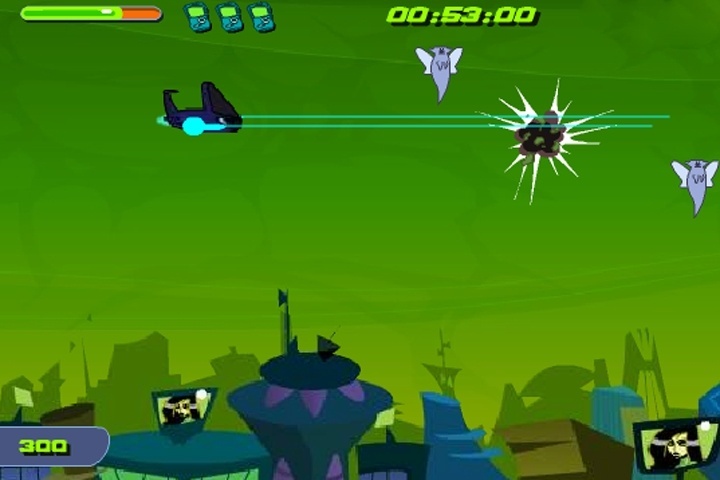 Fly and shoot but also jump and run through various levels. This time Kim Possible is in the future. The first part of the mission is to get to the destination point flying in a spaceship, avoiding obstacles, collecting bonus items and destroying enemy units. Once you get to your destination, you get out of the ship and start playing as Kim Possible. In this part you must jump between platforms and avoid falling. You will also need to deal with enemies. Kim and Ron have traveled into the future to meet up with Jim and Tim! Help them get to the resistance's secret headquarters in the Kim-inator Mark XII so they can plan their next move! Good luck! Use the arrow keys to control Kim or the Kim-inator. Hit the space bar to do a leg sweep, interact with these objects or to fire from the Kim-inator. If you want to play Kim Possible A Sitch in Time 3 Future games online you have come to the right place! GamesLoon adds new Kim Possible A Sitch in Time 3 Future games every week. This is your game portal where you can find the biggest collection of free Kim Possible A Sitch in Time 3 Future games online. Do not forget to rate our Kim Possible A Sitch in Time 3 Future free online games while playing!